Only the full symphony orchestra can impose the true emotional dynamics of the arctic nature. FLUTE MYSTERY is a collection of five orchestral works by composer Flint Juventino Beppe. In this distinctive and dynamic surround sound recording, the Philharmonia Orchestra with Emily & Catherine Beynon as soloists on flute & harp are conducted by the legendary Vladimir Ashkenazy. Vladimir Ashkenazy: I am very fond of Scandinavian mentality, the way people express themselves and their spiritual world. It has always been a very special treat for me to conduct and play Scandinavian music and it is a particular pleasure to introduce to the world a very talented Norwegian composer Flint Juventino Beppe whose music in its own way is a genuine reflection of his world. 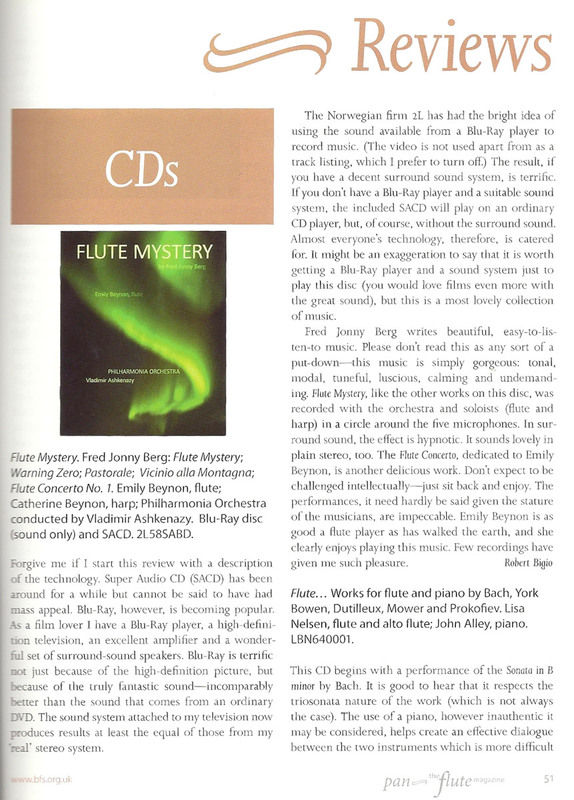 FLUTE MYSTERY was nominated for a Grammy 2010 in the category Best Surround Sound Album. 2L58SABD released on the label 2L (Lindberg Lyd AS). — Flint Juventino Beppe is a major musical discovery. It would be necessary to rewind to the 1940s and Malcolm Arnold to find an emerging composer of such exceeding promise. His compositions are confidently tonal, fluently melodious and possessed of virtually supernatural penetrative power. The flute works receive achingly beautiful, indeed enchanting, performances from Emily Beynon and the Philharmonia under Vladimir Ashkenazy (Beppe conducts the other pieces). This set is recommended for any collector seeking the refined side of contemporary music. Nominated for a Grammy Award 2010 in the category «Best surround sound album».